GENEROUS LOUNGE WITH WOOD BURNER. STUDY. 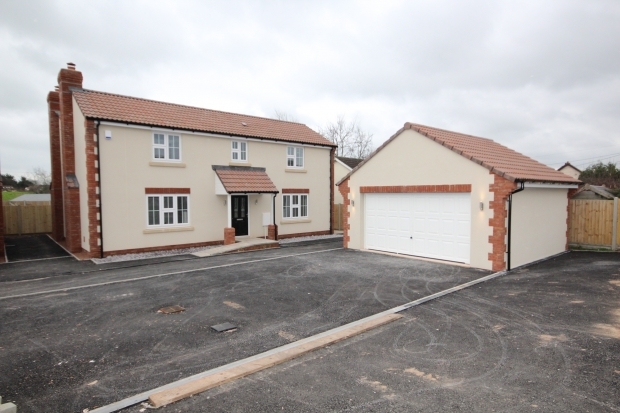 Plot 2, 16 Crown Lane, Creech Heathfield, Somerset TA3 3EU provides an exceptionally large brand new executive style detached house being one of a pair of individual quality built houses situated in a quiet cul-de-sac on the edge of this sought after village. Creech St Michael itself provides a range of amenities approximately 1 mile away and the county town of Taunton is also within 2 miles providing a more extensive range of amenities and facilities together with good access to junction 25 of the M5 motorway and the main intercity rail link to London, Paddington and the South West. Built to a high specification by a local developer and constructed of cavity walling with principally rendered/brick elevations beneath a pitched, tiled, felted and insulated roof the property has a full 10 year NHBC guarantee and offers immaculately well proportioned accommodation briefly comprising to the Ground Floor; Entrance Hall, Cloakroom, Lounge with feature fireplace, Study, large Kitchen/Dining/Sitting Room with integrated appliances and similar Utility Room off, whilst to the First Floor there are Five Double Bedrooms, Two En-Suite Shower Rooms and Family Bathroom with separate shower Cubicle. UPVC double glazing is provided throughout together with gas fired central heating, quality floor coverings and decoration throughout. Outside are very good sized level gardens enclosed to the rear as well as a double garage and driveway providing off road parking for several vehicles. Properties of this nature remain scarce to the market and as such provides an exciting opportunity to acquire a striking family home within a sought after and quiet rural location and as such internal inspection is thoroughly recommended by the vendors sole agents to avoid disappointment. LOUNGE 14’5” x 14’0” Window to front. Feature brick built fireplace with slab hearth and option for either ornate iron multi fuel burner or electric fire to be fitted by developer. Telephone, TV aerial, sky and ethernet points. Heating control panel. Carbon monoxide detector. STUDY 12’1” x 8’0” plus 2ft door recess. Window to front. Telephone,TV, sky and ethernet points. CLOAKROOM Modern white suite comprising close coupled WC and vanity sink unit with ceramic tiled surround to dado level. Heated chrome towel rail. Extractor unit. UTILITY ROOM 9’9” x 5’11” Window to side. Further matching range of floor and wall mounted cupboard units, single sink and drainer unit inset into work surfaces with matching splashback. Integrated washing machine. GALLERIED LANDING Radiator. Airing cupboard housing factory lagged cylinder with immersion heater. Smoke detector. Hatch to felted and insulated roof space. EN-SUITE SHOWER ROOM Window to front. Fully tiled with modern white suite comprising close coupled WC and vanity sink unit with cupboard below. Heated chrome towel rail/radiator. Glazed corner shower cubicle with electric shower unit over. Extractor unit and inset ceiling spotlights. EN-SUITE SHOWER ROOM Window to side. Fully tiled with modern white suite comprising close coupled WC. Vanity sink unit with cupboard below. Wall mounted shaver point. Heated chrome towel radiator. Sliding glazed door and courtesy screen to corner large shower cubicle with electric shower unit over. Extractor unit and inset ceiling spotlights. BEDROOM 3 14’1” x 10’6” Window to front. Radiator. Telephone, TV, sky and ethernet points. BEDROOM 4 11’8” x 10’2” Window to rear affording attractive rural outlooks. Radiator. Telephone, TV, sky and ethernet points. BEDROOM 5 10’5” x 10’2” Window to rear affording similar views. Radiator. Hatch to felted and insulated roof void. Telephone,TV,sky and ethernet points. BATHROOM Twin aspect room with windows to side and fully tiled with modern white suite comprising close coupled WC, vanity sink unit with cupboard below and panel sided bath unit. Heated chrome towel radiator. Wall mounted shaver point. Sliding glazed door and courtesy screen to large fully tiled shower cubicle with thermostatically controlled mains fed shower unit. Extractor unit and inset ceiling spotlights. OUTSIDE To the front of the property is a shared tarmac drive and turning point providing ample off road parking for several vehicles and leading to large detached DOUBLE GARAGE 17’ x 17’ Block/brick built with pitched, tiled, felted roof, power and lighting, window and door to side. Paved path leads up to the main entrance whilst a timber framed side gate provides access to a path into the rear garden which is of a generous size and fully enclosed with large lawned area, paved path and patio. The rear garden affords much privacy and pleasant rural outlooks beyond.